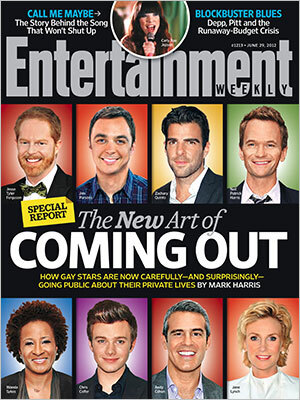 In this week’s Entertainment Weekly special report cover story, writer Mark Harris examines the new, casual method gay celebrities are using to reveal their sexuality publicly for the first time. "Even if it’s accomplished in a subordinate clause or a passing reference, coming out casually is, in its way, as activist as DeGeneres’ Time cover, although few of these actors would probably choose to label themselves as such. The current vibe for discussing one’s sexuality is almost defiantly mellow: This is part of who I am, I don’t consider it a big deal or a crisis, and if you do, that’s not my problem. It may sound like a shrug, but it shouldn’t be mistaken for indifference. By daring anyone to overreact, the newest generation of gay public figures is making a clear statement that there is a “new normal” — and it consists of being plainspoken, clear, and truthful about who you are."